At Gamescom 2017 this weekend, Microsoft announced that global pre-orders of the Xbox One X had begun. The first edition of this powerful new console available will be the 'fan inspired' Project Scorpio edition which you can see in its minimal blackness, directly below. Microsoft also announced a couple of special edition Xbox One S consoles and discussed the wide range of titles which will be enhanced for Xbox One X. 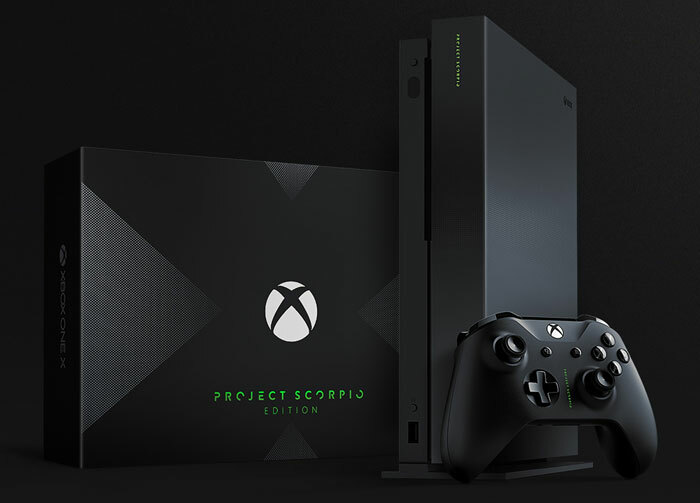 The Scorpio Edition of the Xbox One X comes in an attractive black finish, with 'Project Scorpio' printed on both the console and controller. The official product pages concerning the Xbox One X talk about how the new Microsoft Xbox is "the world's most powerful console," with an 8-core 2.3GHz custom AMD CPU offering 40 per cent more processing power than any rival. Furthermore its 12GB GDDR5 memory subsystem and 6 TFLOP GPU enable lifelike 4K worlds, HDR10 support, with more detail and smoother animations than ever. Over 100 new and existing Xbox One titles will be enhanced to make use of the muscle in the Xbox One X. Example enhanced titles include Halo 5, NBA 2K18, Wolfenstein II: The New Colossus, ReCore: Definitive Edition, FIFA 18, Star Wars Battlefront II, Below and remastered versions of Disneyland Adventures, Rush: A Disney-Pixar Adventure and Zoo Tycoon. For a full list of enhanced games check out this link. Project Scorpio is available to pre-order now at 499 USD / 449 GBP / 499 EUR while stock lasts. Consoles will ship starting from 7th November. Microsoft is still looking to grow the regular Xbox One user base with two new 'S' editions. It announced the Xbox One S Minecraft Limited Edition Bundle (1TB, available from 3rd Oct) plus separate Minecraft Creeper and Pig Wireless Controllers (PC compatible, available from 5th Sept). Then there's the Xbox One S Shadow of War Bundles (500GB and 1TB) coming in October. At Gamescom Microsoft announced quite a lot of new games coming to its console over the coming months. You can read more about them on the official Xbox Wire blog. However, the blog doesn't go on to provide news of enhanced backwards compatibility. Gamespot picked up a morsel of news about this topic as it talked to Microsoft's Xbox boss Phil Spencer who confirmed that backwards compatibility support for original Xbox games is still in the works and due "this year". That's great for people who have not just old Xbox 360 games gathering dust but various original Xbox titles they'd like to play again too. As a reminder these original games will look and play better on the new Xbox One consoles, asserts Microsoft. VEGA chronicles on energy consumption: from sources, the RX580 level graphics in this machine uses less electric power thanks to AMDs refinements on the GPU, Raja should have used the same techniques on the VEGA 56 to make it more environmentally friendly. Its because big Vega is a dual use GPU clocked much higher?? The 14nm process AMD uses is more optimised for lower clockspeeds. Not falling for this trap, I will await the actual real next gen consoles before even giving another console a second look. If you had already bought the OG X1, bought a gold account for the last few years and then traded it in to buy one of these… you may as well have built a similar priced PC with far more features and performance for your money! IMO a console should “just work” without any upgrade temptations until the new gen arrives, otherwise you may as well just be upgrading a pc every few years instead. And £450 for essentially a locked down mid ranged PC containing RX480/GTX1060 level GPU performance is silly, spend a tiny bit extra and you can build far better yourself. Well, I might go for one of this new-gen boxes, but not at pre-order prices. And no way am I paying £450 for one, unless it comes with one heck of a games bundle. I don't care what the components cost, or an equivalent PC games build is, I'm just not paying that for a bare-ish games console.